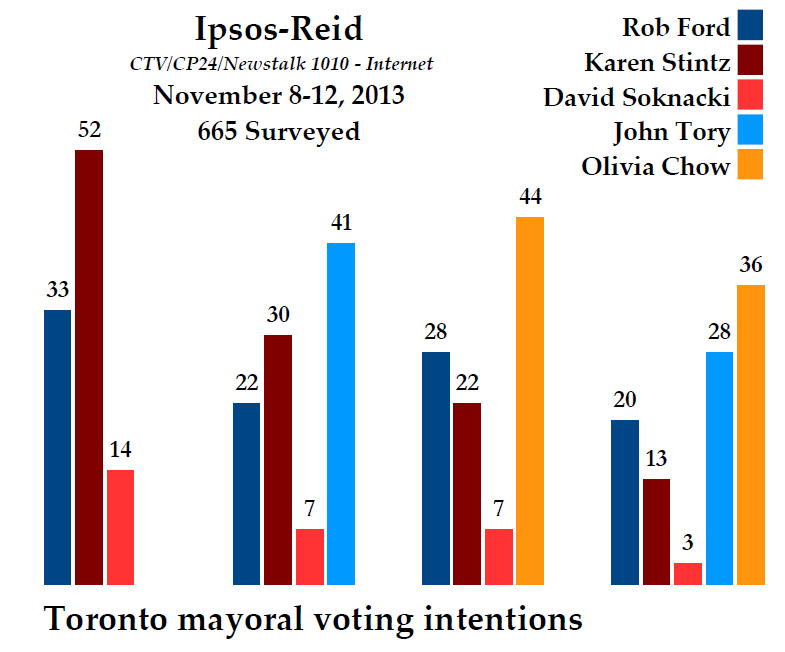 Ipsos-Reid has jumped into the municipal fray, helpfully providing us with a different look at what Torontonians are thinking about their mayor and who they might want as their next mayor. The results are not good for Rob Ford, as the poll suggests that, no matter who else is on the ballot, he will lose. The poll also shows that Ford has a high degree of notoriety, as well as now being notorious. This should come as no surprise, considering he has been plastered across the front pages and the news bulletins, and he has been mayor since 2010. 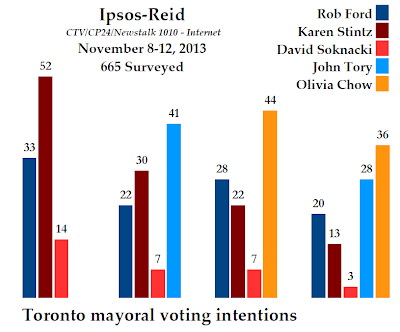 But the Ipsos-Reid poll took a look at just how familiar Torontonians are with some other potential and declared candidates for next year's mayoral race, and it hints at who the likely frontrunners will be. Almost everyone surveyed had heard of Rob Ford, with 81% saying they were very familiar with him and 17% saying they were somewhat familiar. Only 1% said they were not really familiar, and another 1% had never heard of him. They probably just moved to Toronto on the day of polling from a country without television/radio/smoke signals. Olivia Chow, current NDP MP for Trinity-Spadina, had a relatively high degree of name recognition considering her generally modest profile. Almost one-half, or 47%, were very familiar with her and another 36% were somewhat familiar with her. Only 7% had never heard of her. Chow was most well-known in the old city of Toronto, at 89% very/somewhat familiar. Close behind her was John Tory, former mayoral candidate and former leader of the Ontario PCs. He had a notoriety of 76%, with just 9% never having heard of him. He was most well-known in York/East York, at 81%. After him was city councillor and declared candidate Karen Stintz, with 29% being very familiar of her and 35% somewhat familiar. She was most well-known in York/East York, at 70%. Considering that 58% of respondents said they would absolutely vote in the next election, a number that would actually be quite good for a municipal vote, the notoriety of these four potential and declared candidates seems to be good enough. A campaign will undoubtedly close the gaps. Norm Kelly, current deputy mayor, was very or somewhat familiar to 36% of Torontonians while David Soknacki, former councillor and declared candidate, was familiar to just 16%. Almost half had never heard of him. How would these candidates do in the various scenarios that could play out in October 2014? Stintz, Tory, and Chow each have a winning scenario. Ford does not. And Chow seems to be the most strongly positioned, as she wins the two scenarios in which she was included in Ipsos-Reid's polling. If no other candidate decides to run apart from those who have already declared, Stintz wins handily. She would take 52% of the vote, compared to just 33% for Ford and 14% for Soknacki. Stintz would win every region of Toronto, though the race in Scarborough would be close (43% to 41%). She does best in York/East York with 61%. Ford would have his best score in Scarborough, but would take just 24% of the vote in old Toronto. Soknacki would take 17% in Scarborough and just 5% in York/East York. If Tory throws his hat into the ring, he comes out on top. He would win every region and take 41% of the vote, with Stintz finishing second at 30% and Ford falling to third with just 22% of the vote. The contest in old Toronto would be close, with Tory edging out Stintz 38% to 36%. Tory would do best in Etobicoke with 45%, while Ford would take 30% of the vote in York/East York and drop to just 16% in Toronto and Etobicoke. If Tory does not run but Chow does, she then has the winning hand. She would, again, win every region and take 44% of the vote, including 60% in old Toronto. Ford would take 28% and come a close second in Scarborough (36% to Chow's 40%) and North York (31% to Chow's 36%). Stintz is hurt more by Chow's candidacy than she was with Tory's, as she would drop to third with 22% of the vote. If both Tory and Chow join the fray, the election would appear to be primarily a contest between those two. Chow would win with 36% of the vote, taking a majority in Toronto and winning Scarborough, while Tory would capture 28% of the vote and prevail in Etobicoke, North York, and York/East York. Ford would place third with 20%, doing no better than 24% anywhere in the city, while Stintz would fall to fourth with just 13% support. In none of these scenarios is Rob Ford even close to winning. Fully 50% of Torontonians said they not vote for Ford under any circumstances, meaning his pool is quite small. Another 13% said they somewhat agreed that they would not vote for him in any circumstances, reducing his potential pool of supporters even further. Really, his base is the 19% of respondents who strongly disagreed that they would never vote for him. This seems to be confirmed by his bottoming out at 20% in the final scenario. There is simply no winning hand for Ford in this poll. The survey does include a great deal of information on who each of these candidates' supporters are. Using the crosstabs from the final, all-in scenario, we can profile their average supporter. The remnants of Ford Nation appear to be men over the age of 55 who have a household income of $40,000 per year or less, and have at most a high school diploma. Stintz's typical supporter also makes less than $40,000 per year, is between the ages of 18 and 34, and is high school educated. A John Tory supporter has a household income of more than $60,000, is over the age of 35 and has a post-secondary education. An Olivia Chow voter makes less than $100,000 per year, is under the age of 54, and is a woman. Polls like this showing Ford's vulnerability will certainly not deter new candidates from joining the race. Chow seems to have the widest appeal and greatest potential to win, but John Tory could also make a good run for the job - particularly if Ford's numbers continue to slide. Among the most committed voters, as well, both Chow and Tory tend to do better while Ford's numbers generally decrease. Among the most committed voters, Stintz beats Ford with 55% to 32%, Tory beats Stintz and Ford with 45% to 30% and 20%, and Chow beats Ford and Stintz with 45% to 29% and 20%. With a full deck, Ford drops from 20% to 19% and Stintz from 13% to 10%, boosting Tory from 28% to 32% and Chow from 36% to 37%. This suggests that in an actual election, the race would really be between Tory and Chow even more than the general numbers show. That would be an interesting race - and fears that Rob Ford could slip through the middle would be unfounded. No winning hands? I hear Rob Ford get's plenty of those at home too. Early days but, good news for John Tory. I suspect he will run for mayor in the fall. One scenario missing is Tory vs Chow without Ford. I assume most of Ford's support would go to Tory (or stay home). This was my question as well. If Ford, Stntz, Tory, and Soknacki (all right of centre) are in the race, the right-wing vote will be split making a Chow win likely. Éric, have you seen any analysis on the effect of turnout in the last election in 2010. Turnout was fairly high for a municipal election (~53%). It was 39% in 2006, 38% in 2003, 36% in 2000, and 45% in 1997 (the first amalgamated city election). Was the higher turnout due to Ford attracting previous non-voters or anti-Ford voters more motivated to turn out to stop him? How will turnout affect the results of the next election? I would imagine this is the sort of situation in which turnout will be high, and it will be very bad for the incumbent. Hope they're all ready, Vote may come soon of provincial government intervenes. Not sure - in Quebec in Laval and Montreal the mayors were just replaced and the vote waited until the scheduled date. If Ford is removed, there may be a caretaker administration and the scheduled vote in October. There is no necessity or requirement for an election. If Ford had died the Deputy mayor would take over. Remove Ford and it is the same situation ! Under the law if Ford left office there is a legal obligation to hold a by-election. The only exception is if Ford resigns after March 31st in an election year. Consider reading the act before pontificating. No Peter it doesn't work that way. "(2) Despite any Act, no by-election shall be held to fill an office that becomes vacant after March 31 in the year of a regular election and no by-election shall be held with respect to a question or by-law after March 31 in the year of a regular election unless it is held in conjunction with a by-election for an office. 1996, c. 32, Sched., s. 65 (2); 2002, c. 17, Sched. D, s. 24 (1). Gee Bede you just don't get it, do you ?? He goes on medical leave, Deputy Mayor takes over, no election required ! Uh, bede, that passage does not contradict Peter at all. It defines the situation in which council is *forbidden* to schedule a by-election. It does not tell us when council is *required* to call a by-election. I know that when the first court ruling came down that would have removed Ford from office over conflict of interest, the explanation in all the media was that, if that decision had survived appeal, council would have had the *choice* whether to hold a by-election or fill the vacancy by appointment, and there was much debate over that very issue. I am baffled as to why a by-election would be required in any other situation (although I personally think it should be) if not in that situation. You need to read! Nothing in either the Toronto Act or the Municipal Government Act requires or instructs the deputy mayor to be appointed as mayor! A member of council may be appointed to a position, which does not take away the possibility of the deputy mayor assuming the mayoralty, but, your assumption that the deputy mayor would take over is incorrect. MGK, Peter insists, incorrectly as usual and without proof, that the deputy mayor must be appointed. This is not true. I do not understand why Peter insists in distributing false information. You are right that section of the Act states when a by-election is not required. The implication being that a by-election is required in most circumstances. One needs to look at the intent of the Act. Obviously, the intent of the Acts is to have democratically elected governments that are accountable and well run-good government. Therefore, the appointment process is meant as a stop-gap measure until a vacancy is filled via a by-election within a specific time period. let's keep the tone civil, bede. CI am more than civil chimurenga. What is uncivil or just plain rude are comments such as; " Gee bede you don't git it, do you". Try to remember thatbede please. The Torontp Council is clearlu operating within the law when they rescind a Toronto Bylaw which granted the Mayor all sorts of legal powers. All Ford has now is statutory powers which are actually pretty minimal. I don't accuse Toronto of acting outside the law. Why you accuse me of doing so is odd. I have come to the conclusion that you have difficulty maintaining civility or acting politely. You are simple far too partisan to be fair. Both of which in essence claim that Toronto is going to or will act outside the Provincial Law bede. They are your posts. You accuse me of not reading or knowing the law and go on to pontificate that Toronto can't do something they had no intention of doing. I never claimed that anything I suggested was outside the law but you sure did !! Sorry if it hurts ! It's a pity that Soknacki doesn't have a higher profile. Really good candidate. Centre-righ, fiscally conservative but with a heart and a history of building consensus and working with people of all political stripes. After Jack Layton's massage parlour escapades became public he had his best political campaign ever. Seems like Canadians really like flawed individuals that would be interesting to have a beer with. Ford has finally given Toronto the world class city classification that it has craved for so long. Never has the American media covered Toronto as much as the attention that Ford has provided. Layton's "massage parlour escapade" was that he went to have a massage... hardly on the order of crack-smoking and connections to organised crime... And is this really the way you'd like to have Toronto get noticed? What a dilemma presented to the soft on crime Left. Does Ford deserve punishment/Condemnation or support/rehabilitation? How the voters treat Ford will provide an example that they do not consider alcoholism a disease. If Toronto fires Ford does that justify firing all folks with a drinking/drug problem? I think most caring people would in fact want Ford to get rehabilitated. He needs to get his substance abuse treated. Ford's being hoisted on his own petard though. It's not the "left" that said the only treatment for a crackhead is prison - that was Ford. It wasn't the "left" that said Toronto can't have a safe injection site because it would attract crackheads either. Though to be fair, I guess Rob Ford would know what does and doesn't attract crack users, wouldn't he? How simplistic is your false dichotomy. How about, yes the guy needs to deal with his health issues including his alcoholism, drug addiction, and any underlying mental illness he might have. No, he should not be in a position of responsibility that he's incapable of handling. I'd say the same if he were medically incapacitated in some other fashion. Moreover, if a transit driver, for example, refused to take a medical leave of absence to deal with her, say, post-concussion syndrome, and insisted on driving busloads of people around while experiencing dizziness with blurred vision, I'd say there would be no choice but to fire her, even though it is clearly a medical condition that may be impairing her judgement. I mean, haven't you ever watched Star Trek? If the Captain can't look after the ship, you don't sit back and hope that Starfleet Command will choose someone fit to command a year down the road. The doctor yanks him off the bridge. How bad of a job has Ford done relative to other politicians? Has Toronto suffered more under his leadership or David Miller? Has he made a broken public trust or wasted public tax dollars anywhere as bad as Dalton McQuinty? By all unbiased measures he has done an adequate job as Toronto's Mayor. Ford has done this while being Ford. He just didn't start taking drugs or develop this disease the last 2 weeks. Are there any specifics where his disease caused him to perform his duties as Mayor as bad as Miller? So you basically want him out of the mayors office because of his disease. Once you condemn Ford for his disease then where do you draw the line at physical disabilities disqualifying you from office. Was Quadriplegic MP Stephen Fletcher as able to fulfil his responsibilities as a MP and Minister of State with severe pain issues that were alleviated after years of suffering with a new longer titanium rod inserted. He was Minister of State for years dealing with his disability and pain for years. Unless you take the stand that alcoholism and chemical dependency is not a disease then you are basically saying that you want Ford removed from his job that he is fully capable of handling because of his disease. That is quite an insult to diseased people. Addiction is a disease, but it doesn't excuse illegal and boorish behaviour. Being an alcoholic does not excuse driving drunk. Everything Rob Ford achieved he achieved through the helped of his extremely smart team of advisors and staff - people like Kouvalis and Towhey. Those people are now gone, and all that's left is this wreck of a human being. If your disease is a affecting your work, then yes you should step down. If your work is causing your health to deteriorate (which it clearly is) then it's time to stand down. If not for Toronto's sake, then for the sake of his wife and children. You say Rob Ford has done an adequate job as mayor. That's open to debate. What isn't open to debate is that there are far better choices to carry the banner of fiscal conservatism in Toronto, and those choices are having their electoral chances hurt by Rob Ford prolonging this. Even when you have a disease, you still have an obligation to get that disease treated. I don't see how having a disease makes you divulge to the world that you eat plenty of "cat" at home either. Unless he was drunk during that press conference. And if he was drunk at that press conference, how in the hell do you think he's fit to be mayor?